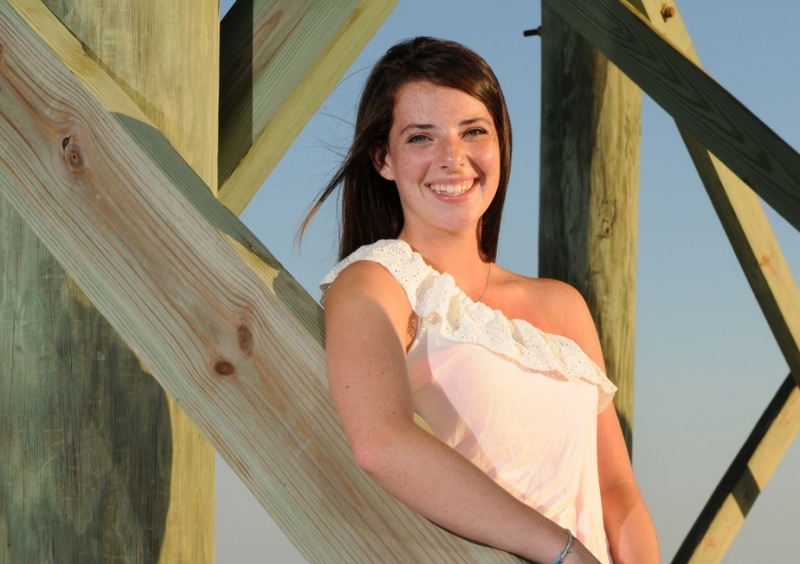 Tropical storms can be a bit stressful for this Panama City Beach senior portrait photographer. The weather was touch-and-go for a few days before my Panama City Beach family beach photo session with the Spicer family. Luckily, Tropical Storm Debby scooted out of the Panama City Beach area the day before our photo session allowing the sun and blue sky to finally come out for the first time in days. The weather was just about perfect. Not too hot and just a slight Gulf of Mexico breeze. The Spicers (and accompanying crew) were a fun and photogenic group and it was really hard to not get a good photograph of them. The majority of our beach time was spent photographing high school senior portraits of Chelsea. We started off at one of the picnic pavilions at St. Andrews State Park. I had never photographed there (or seen anyone photograph there) and thought it would be a great opportunity to get a little different kind of beach photo. From there we headed over to the pierâ€¦.and boy was it crowded! There were photographers and families scattered all over the area, but we still managed to get plenty of nice, clean senior portraits. Now to the jetties. I do not know what it is about the jetties, but I love shooting there. The combination of natural and man-made beauty really makes for a nice area for photography. After getting several angles at the jetties, Chelsea & I headed down to the water. She got ankle deep into the water and I instantly had an idea for what I wanted the photograph to look like. Nowâ€¦.could I pull it off? The only problem was the sun. It was still pretty high and on full-power. That was OK, though, because I had my trusty flashes paired with remote triggers that can help overpower the sun. It took a little tinkering, but I finally got the shot that I had envisioned in my head. After that victory, it was time for some family photos. The rest of the family had been patiently waiting in the wings for a while now and now it was their turn. I grabbed my light meter and started balancing the light. After getting my readings, I lined them up and started photographing away. We got a few â€œstandardâ€ photographs and then moved onto the fun stuff. Jumping! These guys and girls had some jumping skills. They jumped into the air a couple times and then jumped off the dune a couple times more. We nailed the perfect photo and then got a few more shots as the sun turned into a fireball on the horizon. Walking back to the car I realized how lucky I am to be a photographer in Panama City. I get to meet nice families like the Spicers and photograph in one of the most beautiful places on Earth.